Industrial activities at sea are not new but the development of sea going structures for the exploitation of natural resources in these locations is on a scale of technology unprecedented in mankind history. One recent example is the gigantic deep-draft caisson deployed by ExxonMobil over the Hoover Diana fields in the Gulf of Mexico, 260 km south of Galveston TX. Hoover was discovered in January 1997, 25 km east of Diana. The two fields contain estimated recoverable reserves exceeding 300 million oil-equivalent barrels. Vertical pipelines called risers deliver oil and gas from wells in the Hoover reservoir up to the caisson vessel. Two lines carry Hoover-Diana's oil and gas to shore through one of the longest pipeline systems in the Gulf of Mexico. Subsea wells in the Diana field send oil and gas back to the Hoover caisson vessel for treatment before it goes by pipeline to shore. The deep draft caisson vessel is moored via 12 anchor lines, which extend in a radial pattern from the hull. The mooring lines will be 2,100 m long and will connect to piles driven into the sea floor, approximately 2,000f m from the DDCV (at a lateral distance of about 1,500 m). The mooring lines are taut, but will have some flexibility and form a catenary between the hull and ocean floor. Each mooring line consists of chain in the top and bottom sections and spiral-strand wire rope in the middle section. 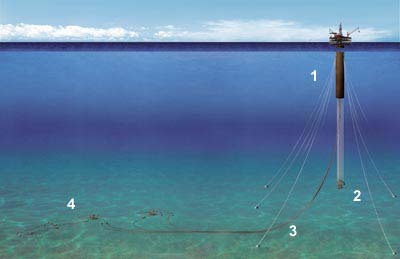 Such offshore environment has a considerable impact on the choice and use of materials offshore. Subsea pipelines are key both to field development and the transportation of oil and gas. It is also a key global industry. Since a broad range of conditions will usually be imposed on a material, the impact of seawater on its performance is determined by numerous variables such as condition of the material, system design, fabrication procedure, seawater temperature and flow regimes, biological activity, and presence of oxidizing compounds or other biocides. Additional factors to consider in choosing a material for a marine system are obviously its physical and mechanical properties, availability, cost, ease of fabrication and maintenance, anticipated design-life and previous design experience.